Q. Grigor got very emotional when he talked about missing set point in the third set. How important for you was it to win the third set? RAFAEL NADAL: Sure is very important win the third set. You are coming back after first set and winning the next two and winning the next two in both tiebreaks, is a tough moment mentally for the opponent.After that, if I am ready to stay strong at the beginning of the fourth, I know going to have my chances. But was important moment. Finally was decisive. If that ball, that forehand from him, goes in and he win the third, I going to keep fighting, because I felt that I was ready for the fight. I was tired, but I think that he was tired, too.I will keep fighting until the end. Q. You've been in tough positions in your career before with injuries. Today it looked like the serve was not your normal serve, then maybe the forehand to the other side. Is it a problem holding the racquet? RAFAEL NADAL: No, with the forehand is not a big issue. With the serve, little bit. I feel that with the tape I can lose the racquet when I serving. That's my feeling, no? The racquet can goes. That's a terrible feeling for a serve, because then when you have this feeling you are not able to accelerate at the right moment.You lose a little bit the coordination. Yeah, that's a big deal. But right, I served slower. I served bad. I was able to win a match against a very difficult opponent, so that has much more value than when everything is great.And because of these victories, sometimes happens that next day you are able to play much better, and these victories at the end of the year are more important than the days that you are playing great.By the way, I didn't feel that I played that bad. I felt that the biggest problem was the serve because, you know, serve like this produce me a problem for the rest of the things. When you lose the confidence with one shot, one important shot, then you are not able to play with calm the rest of the shots.So I going to try to improve that for after tomorrow that I need. If not, I not going to have the chance to be in the final. I hope to be ready for to improve. Q. Dimitrov said he felt you stepped your level up in the fourth set. Did you feel that was the case?RAFAEL NADAL: That I played better in the fourth? RAFAEL NADAL: Yes, I played better in the fourth (smiling). Yeah, I hit a good shots, good passing shots, good forehands down the line. I was able to play a little bit more confident.But talking about the whole match, is true that at the end we have to analyze everything a little bit. It is true I was lucky in the third, the tiebreak.In the second I had 2 0 and I lost my serve with three double faults. In the third I have 4 3 and serve for 5 3. So the first set was for him.But the next two sets I was, you know, in a favorable position more than him during the set. It's true that we went to a tiebreak. First tiebreak I wined 7 3, 7 4, something like this. The second one, yes, was a tough one. But during the set I was in an advantage.The serve didn't help me to save that advantage. That normally helps me not to win free points, some ones yes, because I improved my serve which helps me to start the points, in a good position, but today was not the case. I didn't start with the serve. I didn't win nothing with my serve, no? No one advantage.That always creates you a little bit of nervous and you will have to fight for every point, and that's mentally tougher. Q. Normally with your forehand you're very effective versus those players who have one handed backhand, like Federer. Do you think that Dimitrov has a way that he's able to control even your forehand, he has some special ability for that? 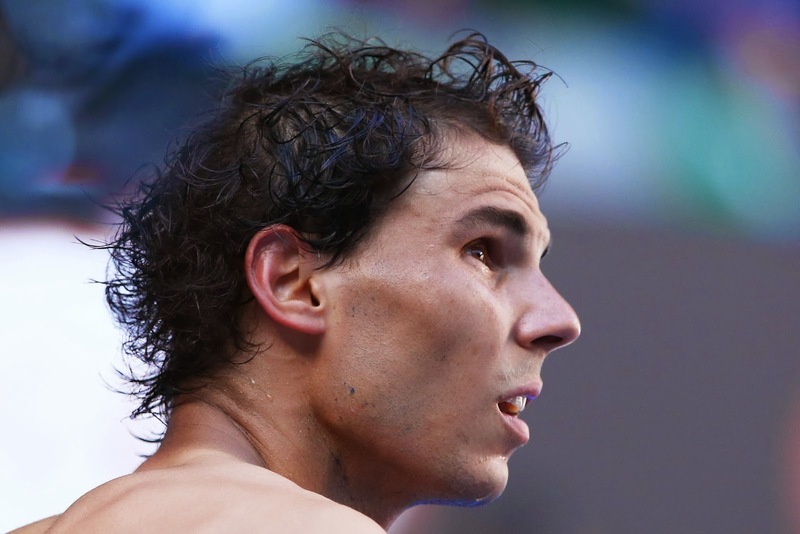 RAFAEL NADAL: Is a difficult question to answer because if I say no, seems I am arrogant. If I say yes, it seems like I say, I don't know, he has a better backhand than Roger.I don't feel that thing. I feel that he's a great player. He's able to hit good backhands. It is true that when I am hitting my backhand good and long and with the right spin, I create trouble on him, too.But it's true that here the surface this year is faster. The wind today on court still little bit strong, so is difficult to play with a lot of altitude because it feels like the ball goes so quick. That's it.The rest of the things, I cannot expect he will miss backhands or he will have mistakes if I am not pushing him that much. I feel in the fourth I pushed him more, and then he was in more trouble because he was hitting balls in a tougher situation, more difficult situation.What happened that I am not happy the most important or the most negative thing during the match, in my opinion, was I hit too many forehands. So cross forehands, and he hit a forehand, too.When I am hitting my forehand from that side against his backhand he cannot hit the forehand. He has to hit the backhand, because my ball has to be enough good to push him back. Happened today too many times that I hitted the shot, cross forehand, and he was able to play with his forehand from that side.If I am hitting well he can do it, but then he's in a very bad position. It happened that he hit shots from that side and he still not in very bad position. Something I need to improve more for the next match. Q. One of the players who really loves you is Serena Williams. It seemed like last year a lot of times when you won a tournament, she would win a tournament. After many years of not playing Indian Wells, she's in the entry list for Indian Wells this year. What are your thoughts on that, and do you think it would be good for the game for our greatest woman player to come into the tournament at Indian Wells? RAFAEL NADAL: I really don't remember what happened in the past, but is true that she didn't play there for a long time.Is positive for any tournament in the world that the best player of the world goes. So for every tournament it's great if Serena is playing because she's the most successful player in the last part of the history of the sport. She is one of the best of the history on tennis. I think every tournament wants to see her. Q. It's too soon to talk about the next match, but if you play against Roger or Andy, can you talk about it? RAFAEL NADAL: Well, different opponents, no? If is Roger, we played a lot of times. You don't need to talk about the match. I need to play my best. Even Roger and even Andy.I didn't play against Andy for a while, so we'll see after the match which one going to be the one that I going to play in two days.But the only thing that I know is that I have to play my best, and I going to try. Q. Your opponent mentioned he was impressed with your physicality. Was there a stage in that match where you felt you were physically on top of him? RAFAEL NADAL: No. I was tired, too. I get tired, too, no? The end, important thing is be ready for resist mentally. Sometimes when you get tired, is true that physical trainers will tell you if your physical performance is very good, then your mental part is better.But I am not sure about that, you know. I am sure that you need to be strong physically. But at one point it's more mental than physical. The opponent is important, too.The emotion to keep playing, the motivation to win the match makes you resist little bit more and little bit more, and you always want little bit more. You are ready mentally, you can always resist little bit more.That's what I am thinking when I am tired: I can do it. I can little bit more. Happened in the past. Happened a lot in the past that I resist tough matches, so that's gave me the confidence that I can do it again.But it's more mental part, I think, in my opinion. Q. You said on court after the match that you were suffering. When you're suffering out there, can you actually enjoy the match? RAFAEL NADAL: I enjoyed for moments, yes. But is true that the conditions of there, I don't know, the conditions out there were not easy. Always is tough to play when the wind is there. Especially with that conditions that the ball is fast. Seems like the ball, as I said before, no, when you are hitting the ball, especially when you are playing with the wind, the ball stays not much time in your string. Goes very quick, and is very difficult to have control.If you are not going very early to the ball, then you have a problem. That happen much less when you're playing night sessions, so I going to play night. The only match that I played night and was a full match I played great was against Monfils.That's the way that I need to keep playing. That's the way I'm going to try to keep playing. We'll see if I am ready. I hope. Q. Deep into the match you sprinted and you hit a stab lob, then you ran back and hit a tweener, then a spectacular forehand. Is that one of the better sequences you've had in a while? RAFAEL NADAL: I don't know. I think I played lot of tough and emotional points in my career. Some ones I won the points; sometimes I lost.One big one was against Novak in the final of the US Open, 54, 56 rally, and I lost. Today was spectacular the way the point went, and was happy to win because was an important one.